A ceasefire deal in Syria brokered by Russia and Turkey will come into effect at midnight local time on Thursday, Moscow said, announcing a “reduction” in the numbers of Russian forces on the ground in Syria. The announcement came after Russia and Turkey reportedly coordinated an attack on the Islamic State-held town of al-Bab on Wednesday, with Russian war planes bombing the town for the first time to aid a ground advance by Turkish troops. The Syrian government’s military leadership on Thursday confirmed its agreement to a total ceasefire in Syria. “The general command of the armed forces announces a complete halt to all hostilities on Syrian territory from the zero hour of December 30th,” it said in a statement. A new round of peace talks will also be held within the month in Kazakh capital Astana, with rebel groups guaranteed the right to assemble their own negotiating team. The Syrian National Coalition, a main opposition umbrella group, said it backed the deal. “The National Coalition expresses support for the agreement and urges all parties to abide by it,” spokesperson Ahmed Ramadan told AFP of the deal. 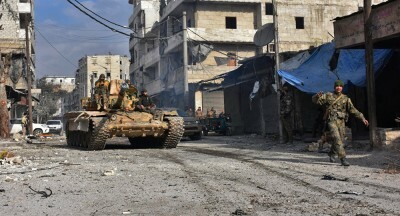 Ramadan told AFP that the powerful rebel factions Ahrar al-Sham and Army of Islam had signed the deal, although there has as yet been no confirmation from rebel officials. The Free Syrian Army has also said that it will agree to the deal, but that it reserves the right to respond to any violations. Turkey and Russia will oversee the implementation of the ceasefire deal, Turkey confirmed on Thursday. Rebel groups are insisting that the ceasefire deal includes all armed opposition factions apart from the Islamic State. However, Turkey said that groups classified as “terrorist” by the UN Security Council – which include both the Islamic State and Jabhat Fateh al-Sham, the rebranded version of al-Qaeda affiliate al-Nusra Front – would not be part of the deal. Russia also added that any group that had not signed Thursday’s agreement would be considered “terrorist,” hinting that other groups could be excluded from the ceasefire deal. Russia’s defence minister, Sergey Lavrov, said seven rebel groups had signed the ceasefire deal, stressing that these groups include some 60,000 fighters. There are to be no geographical exclusions from the ceasefire, Free Syrian army adviser Osama Abu Zeid announced on Twitter. Russia had reportedly insisted that Eastern Ghouta, a rebel stronghold close to the Syrian capital Damascus, be excluded from the ceasefire, meaning it could continue to be subject to shelling and air strikes. However, Abu Zeid, who was present at negotiations in Ankara on Thursday, said that no geographical areas would be excluded from the ceasefire. Abu Zeid also claimed that the text of the ceasefire deal does not specifically exclude any group, saying he would show a copy of the agreement during a press conference in Ankara on Thursday afternoon. Russian President Vladimir Putin had earlier announced agreement on a ceasefire deal for Syria and the start of peace talks, according to RT. “This agreement we’ve reached is very fragile, as we all understand. They require special attention and patience, professional attitude, and constant contact with our partners,” Putin said at a meeting with Russian foreign and defence ministers. Putin said the ceasefire would not step back from its support for Syrian President Bashar al-Assad however. “I agree with the proposal from the defence ministry for the reduction of our military presence in Syria,” Putin said in a televised meeting, insisting Russia would still continue to support for Assad. Lavrov said Russia was prepared to ask Egypt to join the deal, and said Saudi Arabia, Qatar and Jordan could also become part of the deal. There have been several ceasefire deals during the more than five years of the Syrian conflict – however, all have fallen through after a short period due to alleged violations.